NEW YORK- An animal care program is hoping to raise the spirits of residents at senior living homes by bringing furry friends on weekly visits. The program is made possible by the North Shore Animal League America through its Shelter Pet Outreach Team (SPOT). Through SPOT, North Shore brings therapy puppies and cats to nursing homes, senior citizen centers, and rehabilitation centers. Shari Leventhal is the director of recreation at Harbor House, a residential facility in New York dedicated to patients with Alzheimer's disease and other memory impairments. "There's such a difference in their lives," Leventhal said. "We have residents here, they are not speaking, they are not social, they have a lot of mood swings." "But when you put a puppy in their laps, it turns them into a different person," Leventhal said. Many patients suffering from memory loss often experience side effects like paranoia and depression. 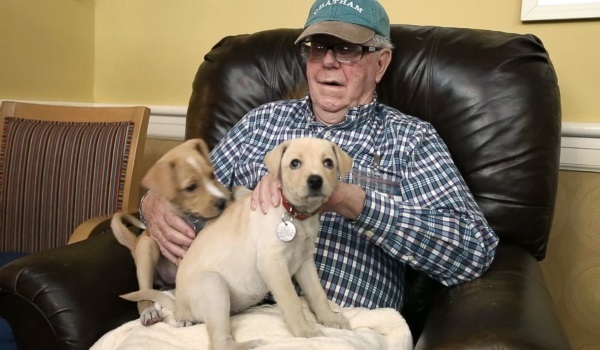 The visiting puppies help boost the quality of life for these seniors. Leventhal adds, "As soon as [they] touch a puppy, [they] start relaxing. They start talking to you, start having memories of their past, and even of their dogs when they were growing up."